Oh, I love this room. I want to spend all day in it. I love the way the sunlight enters in the afternoons, making rainbows dance on the walls as it passes through a prism in the window, eliciting squeals from the toddler as he runs around trying to "catch wainbow." 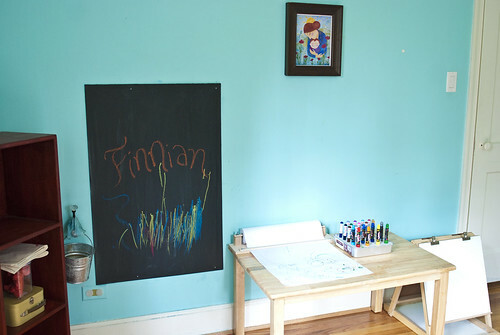 As with everything, Finn and Lachlan's studio/play room/art room is a work in progress. I'm constantly tweaking this arrangement or that activity on the shelf, like any Montessori-teacher-at-heart would. With Finn as my guide, the set-up gets more efficient, more user-friendly with each passing day. I see this room in a state of constant evolution. Right now, it is designed to fit the needs of a baby and a toddler. 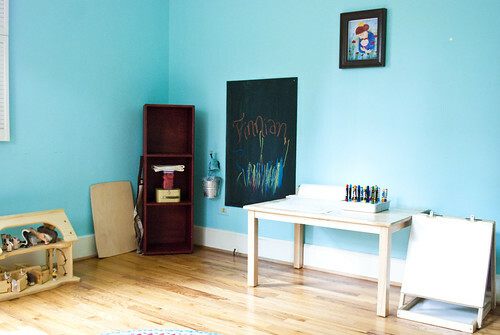 Eventually, it will morph into a homeschooling studio/library/art space. Here you can see the playmat with a mirror for Lachlan, along with a mobile hanger where we will rotate mobiles to maintain his interest. You can also see that I've reserved some shelf space for my stuff. 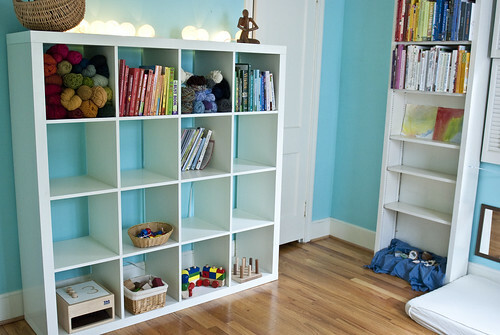 My yarn stash and my child development books can be found there. I've found that having this space for Finn allows me to have just a few more precious moments of knitting time while he's occupied with play or art projects. The basket on top of the shelves contains my current works-in-progress, ready to be picked up at any time. The bottom shelf of the skinny bookcase is showcasing Finn's rocks and minerals as well as any other finds from our time outside. I guess you would call it a Nature Shelf. Here's the art area, which deserves a post of its own later in the week. And finally, since I know you will ask, I'm going to list where I found many of the items you see here. Most of this was accomplished with re-arranging furniture and supplies we already had on hand. 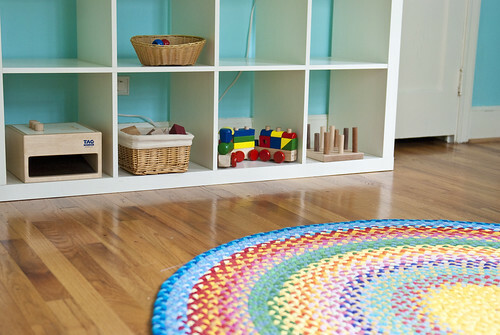 The Rainbow Rug: handmade with recycled t-shirt supplies from Green at Heart. 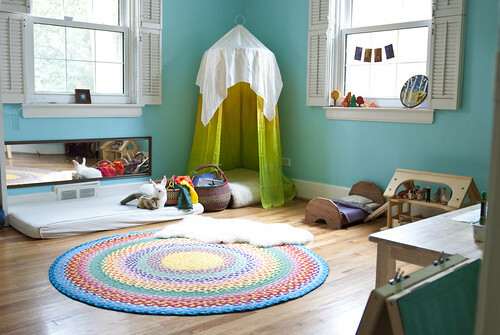 The Reading Canopy: handmade by sewing a 108" x 54" silk to a circular hand-quilting hoop (like an embroidery hoop, only huge! ), adding lengths of hemp twine to the hoop, then attaching them to a sling ring. Another (square) piece of white silk was draped over this contraption, and we used fishing wire to hang it from a hook in the ceiling. 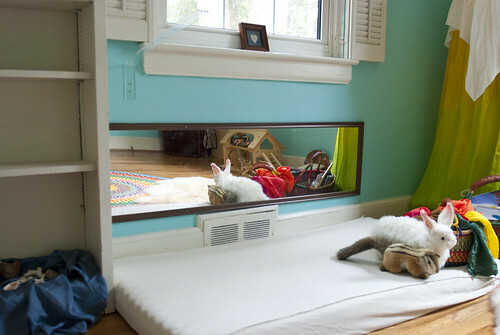 The large floor pillow and faux lambskin were scavenged from elsewhere in the house. I'd like to eventually replace the pillow with a handmade bean bag chair. Baskets: I find most of my baskets at the thrift store, but have a few from a local fair trade store that are handmade in Ghana (the colorful ones.) I've also seen similar ones for sale at Whole Foods. Silks: These really are SO versitile in play - Finn uses them for everything, from peek-a-boo to putting his animals down for a "nap." 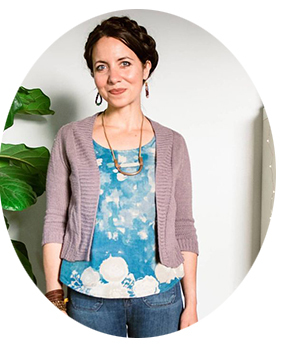 We found ours from Birch Leaf Designs, a family-run business. The Barn: This was Finn's Christmas gift from us, from Nova Natural. 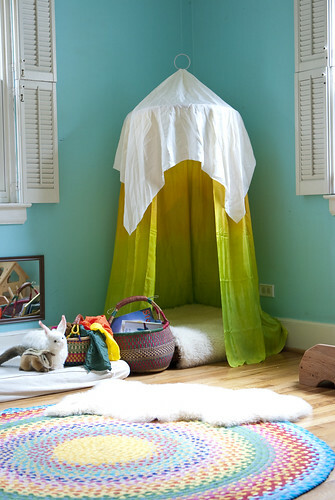 We also have the doll bed from Nova Natural - it was used as a prop in my new book! Bookcase: The IKEA Expidit, relocated from our bedroom. Chalkboard: Handmade by Patrick. We'd like to eventually find an old, wooden frame for it. The galvanized metal bucket hanging from the hook is from our time in Mexico, but you should be able to find something similar at Montessori Services (although not nearly as cheap, I'm afraid!) The bucket contains chalk and an eraser, and I drape a damp washcloth from the hook as well for Finn to use to wipe off his chalky hands. Red shelving: From my old sewing studio, this was originally purchased on the cheap at an unfinished furniture store. This shelf is where I display art activities for Finn. Currently, you can see the supplies for play dough sculpting. Art Table: This was our big purchase for the room, and it's certainly worth it. I was going to steal Patrick's desk from him and cut off the legs, but when he found out, he suggested this alternative. Harumph. The old desk would have looked so cool. But anyhow, this table is of excellent quality, is just the right height for little ones, and can easily fit two children at work. We ordered the 24" x 48" table with 18" table legs. Mama and son print: A gift from the lovely Regina of Creative Kismet - it's called "I Will Help You Grow," and it means a lot to me for obvious reasons. Paper dispenser/roll: We found ours locally, but if you live near an IKEA, you can get one for a very reasonable price. Too bad they don't offer shipping for those items! Marker holder: I'll tell you more about this later, but Finn and I made ours following the instructions in First Art . Tabletop Easel: This is something I've had for quite a while, but I think they still sell a version at Michael Olaf. That should do it! Let me know if you have any other questions and I'll try to amend this resource list. I'll be doing a whole week of posts about this space - I even have a video to share with you tomorrow of Finn in action! I hope you enjoyed the tour.